Benbell Solar offers you the most Futuristic and Advanced Models of Solar Water Heaters with Cutting Edge Technology and Highest Quality at most Reasonable Prices. Benbell Solar strongly believes on a technical audit of the place to evaluate the facility and identify suitable spaces which can house the Solar Water Heater. 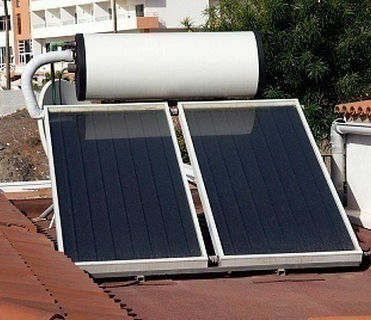 Our Solar Specialist will assist you in diagnosing the appropriate Solar Water Heater based on the space available and your daily water consumption. 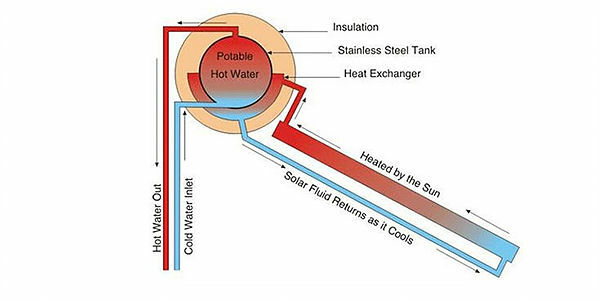 Benbell Solar has extensive experience in designing Solar Water Heaters for any type of roofs whether sheet or flat type. Complete guidance and explanation shall be provided to ensure the correct model selection to be installed at the best place for maximum efficiency. Benbell Solar provides a One Stop Solution for all your Solar Water Heater requirements providing you with multiple choices and models to chose from. Our services are designed to provide you with a hassle-free experience, while maintaining a strong focus on quality and safety during execution at your premises. Quality plays the most significant and important part of our business. We ensure zero compromise on quality standards at any point of time. Our Feild Specialists ensure quality On Site Visits keeping in consideration various aspects of solar heater like shading,direction,tilt and structural design. Also utmost care has been taken to provide the best of solar plant components like solar heat collectors, mounting structures and basic electricals like cabling and insulation. At Benbell Solar, we fully understand that good customer service is not only essential but it is mandatory to keep the wheels of business running and try our level best to to be prompt and sensitive towards attending customers service request by providing them with consistent good service. Our Customer Specialists are continuously in touch with all existing customers to ensure that all our Solar Water Heaters are in good working order and are performing well and without any disruptions. It is our endeavour to provide the most advantageous combination of cost, quality and sustainability to our customers so as to ensure that their journey with us remains to be a positive one with element of Trust strongly embedded to ensure a long lasting relationship. 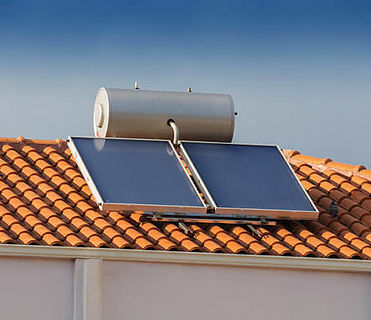 The solar water heater absorbs light by means of a collector placed on the roof and converts it into heat. It passes this heat to a water tank by means of a circulating pump. This exchange is triggered by the thermal regulator, but only when the collector is hotter than the water in the tank. This prevents the circulating pumps using electricity needlessly. Conversely, it also prevents overheating. 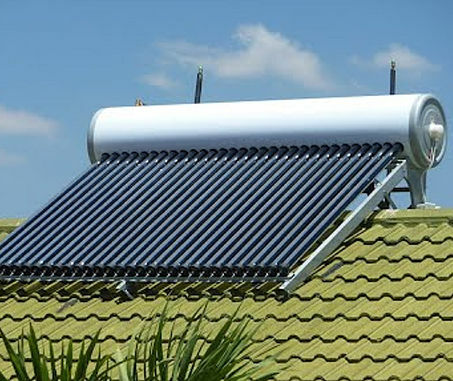 Solar Water Heaters have so many advantages over traditional geysers, immersion rods, or fuel based water heaters. 1. Solar Energy is a Natural and Renewable resource, abundant in nature, which you can use for free! 2. Water can be heated on cloudy days too. 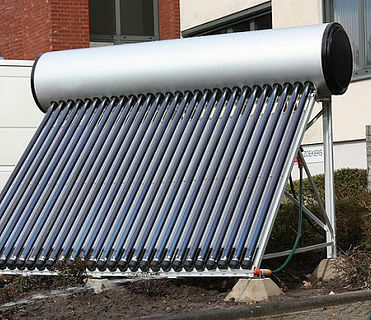 The solar heater uses diffused energy in the atmosphere to heat the water. 3. You can reduce your carbon footprint. 4. You don’t have to worry about the maintenance. 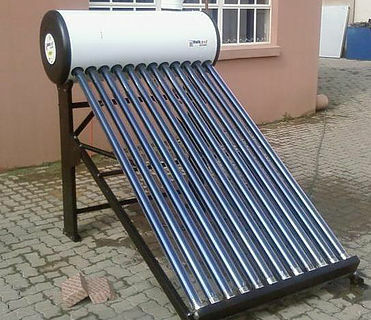 Solar water heaters hardly require maintenance. 5. You’ll earn back the money after some years , henceforth you begin gaining profits. 6. It’s a one-time investment that goes a long way. 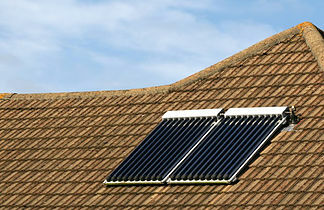 Solar Water Heaters can easily last 15–20 years. 7. 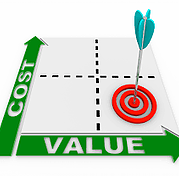 You save money on your electric bills because of reduction in your consumption. 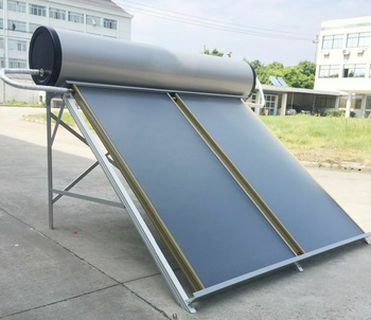 A solar flat plate collector typically consists of a large heat absorbing plate, usually a large sheet of copper or aluminium as they are both good conductors of heat, which is painted or chemically etched black to absorb as much solar radiation as possible for maximum efficiency. This blackened heat absorbing surface has several parallel copper pipes or tubes called risers, running length ways across the plate which contain the heat transfer fluid, typically water. These copper pipes are bonded, soldered or brazed directly to the absorber plate to ensure maximum surface contact and heat transfer. Sunlight heats the absorbing surface which increases in temperature. As the plate gets hotter this heat is conducted through the risers and absorbed by the fluid flowing inside the copper pipes which is then used by the household. The pipes and absorber plate are enclosed in an insulated metal or wooden box with a sheet of glazing material, either glass or plastic on the front to protect the enclosed absorber plate and create an insulating air space. This glazing material does not absorb the suns thermal energy to any significant extent and therefore most of the incoming radiation is received by the blackened absorber. The air gap between the plate and glazing material traps this heat preventing it from escaping back into the atmosphere. As the absorber plate warms up, it transfers heat to the fluid within the collector but it also loses heat to its surroundings. 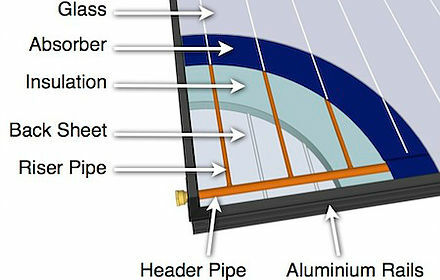 To minimize this loss of heat, the bottom and sides of a flat plate collector are insulated with high temperature rigid foam or aluminium foil insulation as shown. The Evacuated tube collector consists of a number of rows of parallel transparent glass tubes connected to a header pipe and which are used in place of the blackened heat absorbing plate we saw in the previous flat plate collector. These glass tubes are cylindrical in shape. Therefore, the angle of the sunlight is always perpendicular to the heat absorbing tubes which enables these collectors to perform well even when sunlight is low such as when it is early in the morning or late in the afternoon, or when shaded by clouds. Evacuated tube collectors are particularly useful in areas with cold, cloudy wintry weathers. Unlike flat panel collectors, evacuated tube collectors do not heat the water directly within the tubes. Instead, air is removed or evacuated from the space between the two tubes, forming a vacuum (hence the name evacuated tubes). This vacuum acts as an insulator reducing any heat loss significantly to the surrounding atmosphere either through convection or radiation making the collector much more efficient than the internal insulating that flat plate collectors have to offer. Inside the each glass tube, a flat or curved aluminium or copper fin is attached to a metal heat pipe running through the inner tube. The fin is covered with a selective coating that transfers heat to the fluid that is circulating through the pipe. 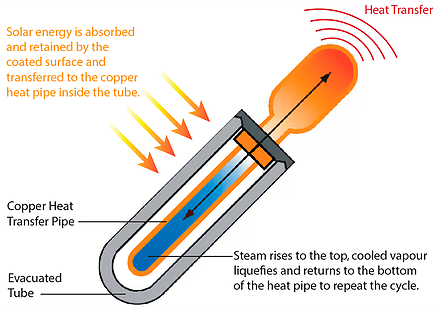 This sealed copper heat pipe transfers the solar heat via convection of its internal heat transfer fluid to a “hot bulb” that indirectly heats a copper manifold within the header tank. These copper pipes are all connected to a common manifold which is then connected to a storage tank, thus heating the hot water during the day. The hot water can then be used at night or the next day due to the insulating properties of the tank. The insulation properties of the vacuum are so good that while the inner tube may be as high as 1500C, the outer tube is cooler to touch. This means that evacuated tube water heaters can perform well and can heat water to fairly high temperatures even in cold weather when flat plate collectors perform poorly due to heat loss.